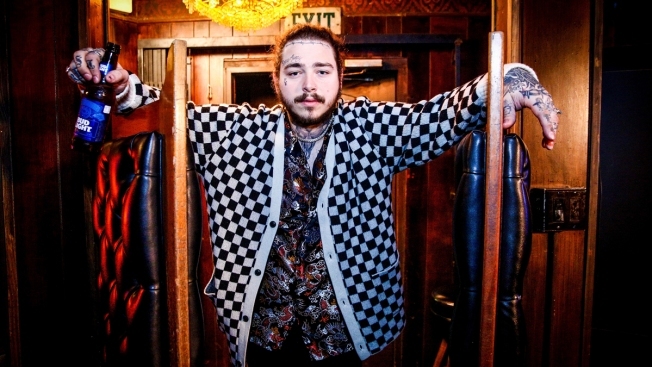 Officials said Malone's white Rolls-Royce Wraith and the other car appeared to be a "total loss"
In this March 20, 2018, file photo, Post Malone is shown behind the scenes before his Bud Light Dive Bar Tour show in Nashville at Footsies Dive Bar in Los Angeles, California. Rapper Post Malone appeared to cheat death for a second time in less than a month. The "Psycho" rapper was involved in a car crash in West Hollywood early Friday morning, according to California police. Officials said Malone's white Rolls-Royce Wraith and the other car appeared to be a "total loss." 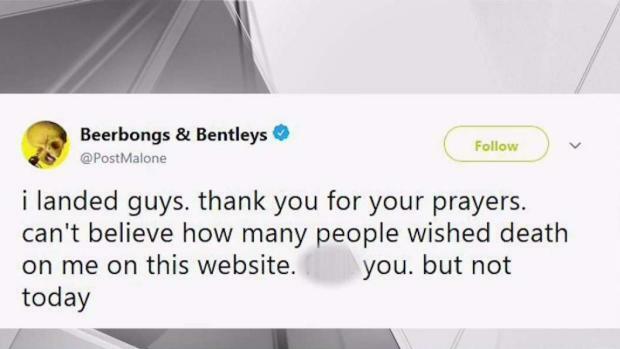 "God must hate me lol," Malone tweeted after the accident. At approximately 2:42 a.m. PT, Beverly Hills police responded to a crash on Doheny Dr. and Santa Monica Blvd. Upon arrival, authorities found a wrecked Kia blocking the roadway and a white Rolls-Royce Wraith crashed through a fence. According to Sgt. Andrew Myers from the Beverly Hills Police Department, the Rolls Royce is owned by Malone but was being driven by his assistant. Malone was a passenger in the vehicle. No injuries have been reported and no alcohol was involved in the incident, Myers said. Investigators were looking into what led to the crash. Last month, the rapper was aboard a Gulfstream IV when the luxury plane's tires blew during takeoff from New Jersey's Teterboro Airport. The plane, which was bound for England, was forced to circle airspace in the Northeast to burn fuel before landing safely in New York's Stewart Airport. A luxury jet carrying rapper Post Malone landed safely, hours after blowing two tires during takeoff at New Jersey's Teterboro Airport. Lori Bordonaro reports. After landing, the rapper tweeted a message for his fans, and for his haters. "Thank you for your prayers. Can't believe how many people wished death on me on this website. F*** you. But not today," he said. NBC Los Angeles' Elizabeth Campos contributed to this report.